The priory of the cathedral of St Andrew, Rochester, possessed a great number of books, most of which became the medieval manuscripts section of Henry VIII's library when the bishop of Rochester's belongings were confiscated in 1534 or upon his execution in 1535. The clerics, monks and canons at the cathedral would have need for many types of books: for study, conducting church and prayer services and for personal devotion. This manuscript, copied in the early 12th century, contained St Augustine's 'On Christian Doctrine' and 'On True Religion'. 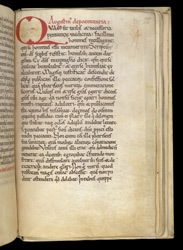 In the late 12th or beginning of the 13th century, the monastery's cantor, Alexander, wrote out a catalogue of all the books owned by the priory on the flyleaves at the front of this manuscript. Where medieval manuscript are concerned, the authorship of writings can sometimes be rather slippery. The last writing included in this manuscript is a homily which in the middle ages was thought to be by St Augustine, but scholars now have doubts, considering it at best to be a fragment of a piece by Augustine which was embellished and expanded by later authors. Perhaps the scribe was suspicious: it is not as nicely decorated as the manuscript's other two established works by Augustine. Nonetheless, it begins with an interesting reference to penitence as "useful and necessary medicine".